Camber is the lean-in, or out, of a wheel, in other words the distance that the top of the wheel is nearer to, or further away from the midline of the car. In general, a small amount of lean-in, with the top nearer to the midline, is desirable and this is called ‘negative’, camber. Negative camber is desirable to keep the tread of the tyre as flat as possible on the road while cornering. You can see why this is so with a pencil rubber or eraser. Hold a rectangular rubber with your right thumb and forefinger. The rubber is the wheel and tyre and your finger is now towards the midline of the car. Press the rubber down hard against a tabletop, and try to pull it towards you. You are now simulating the outside wheel of a cornering car, and the centrifugal force trying to pull the car out from the centre of the corner. Look at the under side of the rubber, as you pull, the edge towards you catches, and the side away lifts. This is what a tyre tries to do in a corner, lifting the inside edge of the tread. The more tread on the road, the more grip, so a tyre in this situation will probably skid. But tilt the rubber away from you, towards the midline of your imaginary car like a tyre in negative camber. Push down and pull towards you as before. The lower edge of the rubber now lies flat against the table surface. More of the tyre’s tread will be on the road and the grip of the tyre will be as good as possible. All Triumph Herald based cars, including Spitfires, were built with a slightly positive camber, as this minimises tyre wear, but common modifications will change the camber. Front springs. The double wishbone (A-frame) is the suspension layout that gives the best compromise when all factors are involved. However it does not maintain the same camber all the time, as the wheel moves up and down. Many owners change to stronger, shorter front springs, for lower ride height. The lower ride height brings the front suspension into a different part of the arc of movement. In this part of the arc, the camber will be different, and may change more as the wheel moves up and down. Adjustable shock absorbers. These allow the lower spring support to be adjusted up and down, altering the ride height and the balance of the car. They will also effect on the arc of movement of the suspension. Lower wishbone brackets. Triumph not only provided us with the best type of suspension, they also made it adjustable! The lower wishbone brackets have shims between the bracket and the chassis rail. Adding shims will push the lower wishbone bracket out, and the top of the wheel in, into negative camber. You can add more than ½” of shims if you really want to, without running out of thread on the bracket bolt! Always add the same front and back. After modifications like this, you should measure what has happened to the camber. This gauge will make it easy to do so. 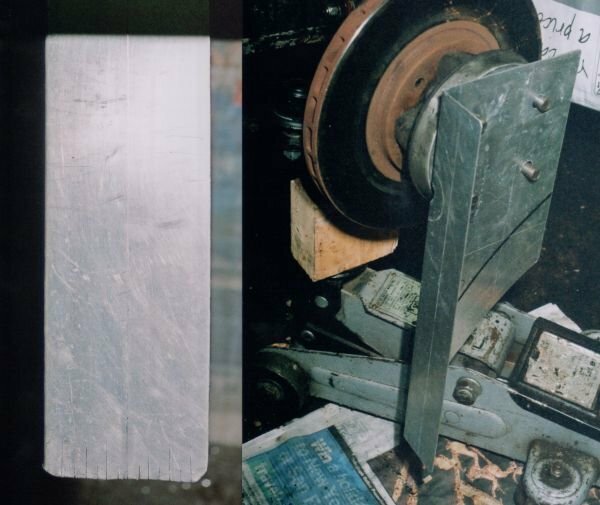 Make it out of a piece of folded metal sheet, drilled as shown to take the wheel studs. The curved edge below the holes leaves clearance for the jack, used to move the wheel up and down. A central hole is also needed, to clear the hubcap(not shown in diagram).
. The dimensions of the gauge are not critical, but should be large enough to take the wheel stud holes. Dimension ‘D’, the height of face ‘A’, should be 350-400 mms, to allow you to measure very small angles. Mark a line down the middle of face ’A’, and a scale along the lower edge, either side of the midline. See the diagram. File a tiny ‘V’ in the edge at the top of the vertical line. I have rounded the distances to the nearest 0.5mm, as I can’t see smaller than this! I recommend using millimetres – inch fractions in decimals are much more difficult. Position the car on a level surface; Secure the car with chocks at the rear wheels. Put someone in the driver’s seat, or a suitable weight. Measure the height above the ground of the outer end of the lower wishbone. Measure the height of the chassis rail at a suitable point. Place a jack under the wishbone, and raise the wheel off the ground. Place an axle stand under the chassis rail, with the car at the same height as before. Adjust the hub so that face ‘A’ is vertical. Using the jack, adjust the wishbone to the same height as before. Hang a plumb bob over the edge of face ‘A’, from the ‘V’ at the top of the line. Tape on the back of face ’A’ will hold the line in place. Read the camber angle at the lower edge. 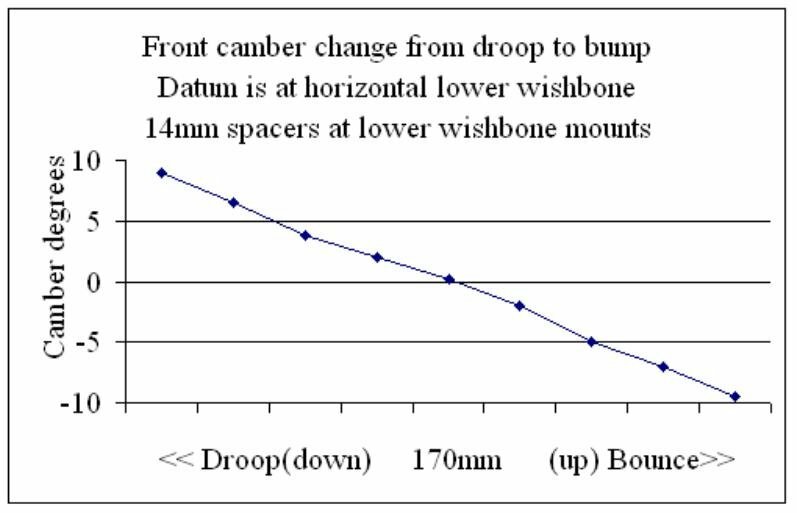 This figure is the camber angle at rest. If you remove the spring and shocker, you can work the suspension from full droop to bump, reading the change in camber angle all the way. The ideal is for the camber to stay the same throughout the arc of movement, but this will not happen! Adjust the shock absorber spring seats, and the wishbone bracket shims to get the minimum change. Again, rive ontop a level surface, leave driver in place. 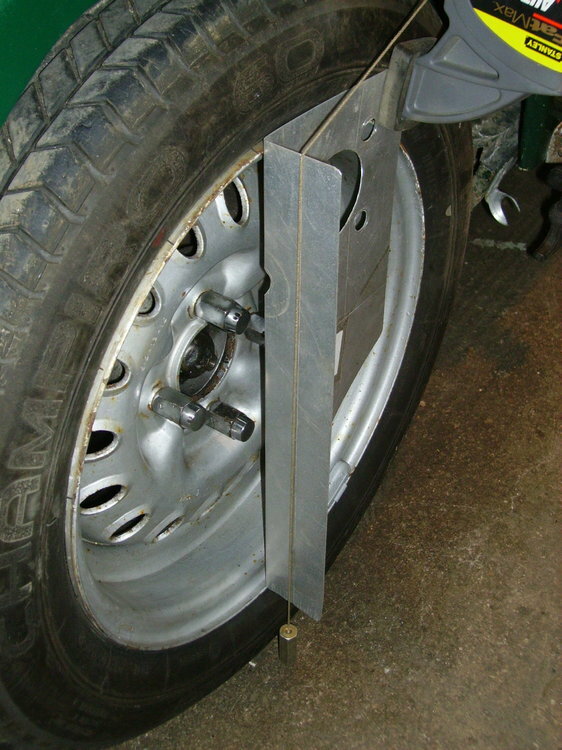 Position guage against wheel - ensure that the lower end is not pushed out by tyre bulge. Ideally, it shoud rest agaianst the rim, top and bottom.